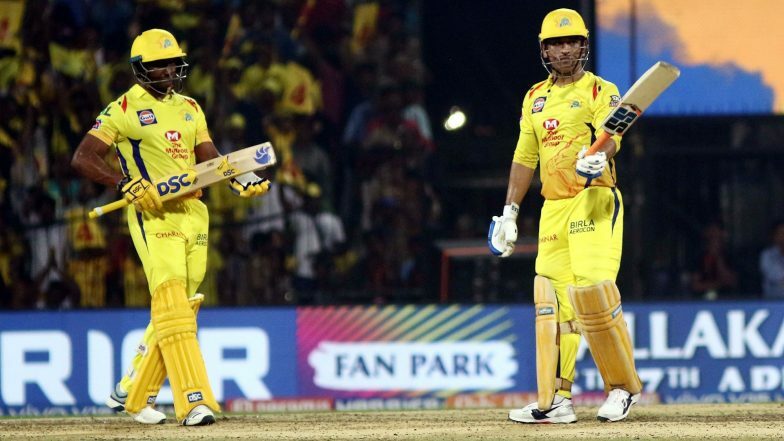 Chennai, April 11: Mahendra Singh Dhoni is a legend in his own right and Chennai Super Kings all-rounder Dwayne Bravo feels while people talk about passionate fans that Chennai has, there are some who are exclusively Dhoni fans. The beauty of it, the former West Indies all-rounder said was that people coming out to cheer for Dhoni invariably support CSK, who get crowd support even away from home. RR vs CSK, Head-to-Head Record: Ahead of IPL 2019 Clash, Here Are Match Results of Last 5 Rajasthan Royals vs Chennai Super Kings Encounters!. "We are led by the best in the world and that attracts everyone. You don't have to be just CSK fans, a lot of them are just Dhoni fans. That is the beauty of being led by him because when we play in the different stadium, say at the Wankhede or in Hyderabad, there is a lot of yellow in the stands. This shows the support and fan base he has individually," he said while interacting during Chennai's match against Kolkata Knight Riders. Chennai fans are known to be one of the most passionate in the world and Bravo feels that it always helps to have the backing of the crowd as that also brings out the best in the players. Rajasthan Royals vs Chennai Super Kings Live Cricket Score. "It is good, the people in Chennai are very passionate about the game, the sport and about Chennai Super Kings. Every game is a full house and even before the start of the IPL, whenever we practice, one stand is always full. Feels good to have that support. When you have a team that is doing well, it attracts everyone," he explained.